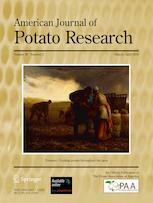 The American Journal of Potato Research (AJPR), formerly titled the American Potato Journal (APJ), is a premier outlet for reporting of scientific advances on the potato. The AJPR is recognized internationally by contributors and readers. View the current issue’s table of contents from our publisher, Springer. review papers, book reviews and symposium proceedings. Abstracts may be viewed at Springer. Join PAA to have access to full length papers.